Well-known for his compositions and arrangements, Andrew R. Mackereth has more than fifty compositions; religious and secular in print; many frequently feature on the concert programmes of premier Salvation Army Bands. These, along with numerous manuscripts awaiting publication, are continually featured on international broadcasts and recordings. Andrew Mackereth was born in Gateshead Tyne & wear in 1965. A fourth generation Salvationist, he first attended a meeting aged barely a week old. The son of officer parents, he has lived in many places including 4 years in Zambia and nine years in Kingston-upon-Hull. It was here that he began his earliest musical training. Andrew earned his Bachelor of Arts degree from the Birmingham Conservatoire and for nearly twenty years taught music in Secondary Schools. He is now a Head Teacher by profession, and continues to be in demand as conductor, composer and lecturer and has appeared throughout the United Kingdom, America, Germany and Argentina. In September 2007, he was appointed Headteacher of the Heart of England School in Balsall Common, England. Andrew lives in Nuneaton with his wife Stella and two children, Eleanor and Joshua. They all attend Nuneaton Citadel, where Andrew serves as Bandmaster. In 2008, Andrew was honoured by the New York Staff Band as the guest at the prestigious: Profile 30. John Davie was born in 1939 and his formative years were spent in the north east of England, near the town of Houghton-le-Spring, County Durham. As a child he attended a Methodist Sunday School eventually becoming a member of the church. As a thirteen year old he was given the opportunity of learning to play the cornet or the clarinet. The cornet won and he has been trying to play the clarinet ever since. His first contact with the Salvation Army was in 1960 and he became a Salvationist in 1962. In 1958 in joined the Royal Air Force and began his musical career as a clarinettist, training at the Royal Air Force School of Music. He then served with the No. 4 Regional Band, R.A.F. Henlow for three years before joining the Central Band of the Royal Air Force. During this time he continued his clarinet studies privately with Stephen Waters (Professor, Royal Academy of Music) and Ralph Clarke (Professor, Royal College of Music). The last four years of service were spent as Head of Woodwind and Instructor at the Royal Air Force School of Music, Uxbridge. During this period he gained conducting diplomas from the Royal Academy of Music, the Royal College of Music and Trinity College of Music (L.R.A.M., A.R.C.M., F.T.C.L.). He has been involved with music making in Buckinghamshire since 1965 and when he retired from full time teaching in 1998 he was Woodwind Team Leader for the Buckinghamshire Music Service. In 1969, with nine clarinet players, he founder what became the High Wycombe Music Centre Concert Band and continued as conductor until 1998. In 1980 he established the Chiltern Concert Band, which is a community band based in High Wycombe and was chairman until 1996. He now still attempts to play the clarinet and is known for his friendly repartee with the conductor(s) and if necessary, if persuaded, will also conduct the band. In 1985 he was invited to organise the Bucks County Youth Wind Band Courses, and was the Director from 1986 to 1993. In January 1987 he became the Director of the newly formed Buckinhamshire Symphonic Wind Ensemble until 1993. In September 1997 he became the Director of the newly formed Bucks Youth Wind Orchestra until 2002. 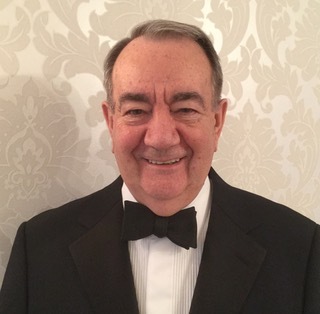 From 1992 until 1997 he was the chairman of the London and Home Counties Committee of the British Association of Symphonic Bands and Wind Ensembles and member of the National Executive. In 1993 he became the co-ordinator for the Altarnon Summer Concerts held in the ‘Cathedral of the Moor’ the Parish Church of St. Nonna, Altarnon, Cornwall and in 1994 the Director of the Altarnon Wind and Brass Instrumental Workshops which were held annually until 1999. In 1994 he co-instigated the establishment of the Salvation Army Symphonic Wind Ensemble and is at present the coordinator. As a Salvationist he has served as Bandmaster at the Uxbridge (1971-1974) and Hanwell Corps (1984-1996) of The Salvation Army. In 1998 he was appointed Bandleader of the Maidenhead Salvation Army Young People’s Band. Also in 1998 he became the Corps Alpha Coordinator and in January 2000 was appointed Chairman of the Corps Mission Cluster Group and serviced in that capacity until 2004. As well as musical appointments he has served as Corps Sergeant Major, Goodwill League Secretary and League of Mercy Secretary. He was a member of the West London Divisional Advisory Council for several years, serving as chairman from 1993-1995. In April 2004 he was nominated for the award of Honorary Master of Arts degree by the authority of the Council and Senate of Buckinghamshire New University. ‘The award is in recognition of his distinctive contribution to the local community over many years and his work in the development of youth music locally and his association with the Buckinghamshire New University .” The award was conferred at a Degree Congregation on 7th September, 2004. John retired as Band Leader at Maidenhead Corps in 2014 after 30 years continuous service as a Band Master and Band Leader. Peter Bale was born in Coalville in Leicestershire, moving to Windsor at the age of 2. It was there that he learnt to play an instrument, learning initially on a C clarinet. Whilst playing in the school orchestra at Windsor Grammar School he moved onto saxophone, and also played viola with the Windsor Schools’ Orchestra. In 1971 he moved to Coventry, attending Binley Park Comprehensive School. During one of the school holidays he borrowed a tenor horn from the school music department, the start of an ongoing interest in brass bands. He became a member of Coventry Festival Band (now Jaguar Cars Coventry), playing tenor horn, baritone and then bass trombone, as well as the Coventry Music Centre Concert Band, where he played saxophone and bassoon. He also sang in the choir at St Michael’s Church. Although offered a provisional place at Cambridge to read economics, Peter decided to pursue a musical career, auditioning for the Coldstream Guards’ Band under Major Trevor Sharpe. The period spent with the band included various recordings, including playing the soprano sax in Percy Grainger’s Lincolnshire Posy for a Radio 3 broadcast within weeks of joining the band. It was whilst living in London and playing in the Guards that Peter met up once more with The Salvation Army. Previous contact had been limited to occasional visits when on holiday with grandparents, but when invited along by his flat-mate Peter became aware that here was a group of people whose lives had a real meaning and purpose. In January 1974 Peter was enrolled as a soldier in The Salvation Army at Balham Congress Hall in South London. Two years later he entered the William Booth Memorial Training College as a cadet in the Disciples of Jesus Session, and it was there that he met Janet, who became his wife shortly after they were commissioned as full time ministers. They served as officers in various Social Services centres for 18 years, the final appointment being at The Hadleigh Training Centre in Essex. It was whilst on a weekend campaign with Hadleigh Temple Band to St Helier in Jersey that Peter met John Davie, and expressed an interest in participating in the proposed wind ensemble. Peter is currently employed in building management in the City of London and is Assistant Corps Secretary at Hadleigh Temple, singing in the songsters and playing BBb bass in the band. His son Jonathan plays percussion with SASWE, and lives in Clacton-on-Sea with his wife Michelle and son Joshua. His daughter, Ruth, is a novice at the Carmelite Monastery in Notting Hill. A founder member of the Salvation Army Symphonic Wind Ensemble, Peter took over from Andrew Stewart as Chaplain, preparing the Bible message and thought that is central to each programme given by the group. He is an active member of theMouthPiece.com, an internet discussion forum focusing on the world of brass bands, as well as contributing concert and cd reviews for 4barsrest.com. Alan was born in Ilford, Essex on 31st March 1947. When Alan was seven he started piano lessons and when he was eight he began learning a brass instrument at the Salvation Army. In 1961 at the age of 14 he auditioned on trombone and piano for the Royal Marines Band Service. Having passed the entrance examination, Alan was taught flute and piano at the Royal Marines School of Music at Deal, Kent. Aged 17 in 1964, he was awarded the Cassels Prize for best overall student. In November 1971 Alan came out of the Band Service to begin his teaching career. Alan became a peripatetic woodwind teacher for various London Education Authorities before gaining full time employment for the London Borough of Redbridge. He gained a teaching diploma from the Royal Academy of Muisc in 1974 and a Certificate in Education in 1981 before being appointed as Head of Woodwind for Redbridge in 1982. During his career at Redbridge Alan composed/arranged extensively for wind band, voice, orchestra, brass band, wind quintet and massed woodwind groups. He was also commissioned by Chappels/IMP to arrange five flute and seven recorder books, some of which are still in publication. The Salvation Army remained a large part of Alan’s musical life and has published several songs and brass band compositions. In 1994 Alan became one of the founders of the Salvation Army Symphonic Wind Ensemble and has composed a large part of their particular repertoire. In December 2000, Alan and his wife, Jenny moved down to Dorset where he died in September 2002. His elder daughter, Melanie is married and has a young son Gregory and a daughter, Elysha Rose. His younger daughter, Michelle has followed her father into the teaching profession and is in charge of the Infants Department at a school in Essex. Alan’s music, however, lives on and more information of his compositions can be found on his website: www.apollo-music.com/www.apollo-music.co.uk or by contacting Andrew Mackereth.